A tram carriage dusted with snow was still hanging from the viaduct when I visited the Corrie cobbles yesterday. Ready and waiting for the hour-long live ITV1 episode next Thursday. I was among a small group of journalists invited to Manchester to be the first “outsiders” to see the two episodes which will be screened on Monday. Plus a teaser trail of events later in the week leading up to that live episode on the night of Corrie’s 50th anniversary. I’m old enough to remember Ena Sharples being buried in the rubble of the 1967 viaduct collapse. As a little lad of 10, it made a huge impression on me. Producer Phil Collinson is the creator of new Coronation Street memories. The perfect choice to lead the show through its half century celebration. After several weeks of long night shoots and sheer bloody hard work, you could see the exhaustion on the faces of cast and production team at yesterday’s event. “We’re all on our knees,” Phil told me. All to deliver a birthday present for Coronation Street fans everywhere, including wide-eyed little 10-year-old lads. Classic television that we will remember for the rest of our lives. 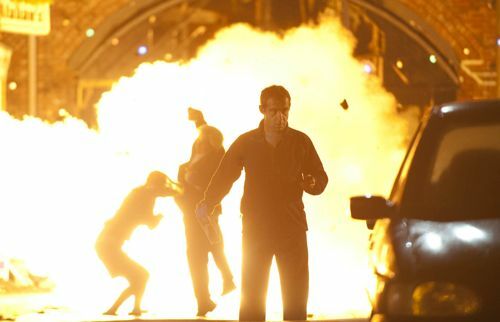 It’s not just about amazing stunts, CGI and special effects, which begin with the gas explosion and later tram crash at the end of Monday’s second episode. At the heart of this spectacle are the characters we know so well – and how the tram impacts on all of their lives. Including some truly heartbreaking scenes, beautifully played by those involved, that will cause you to hug your loved ones just that little bit tighter. As Phil told us: “It’s actually about a tiny street in the north of England battling against the adversities of life. The Magic Circle would be proud of how all the current storylines are weaved together to meet just ahead of the blast on Monday. It is a truly astonishing moment. 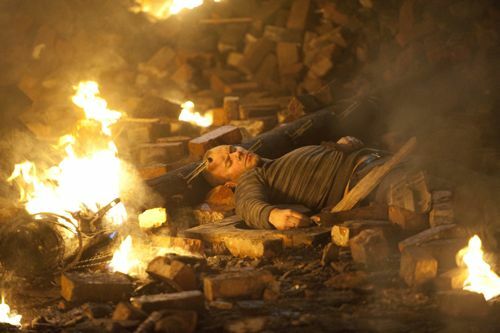 Coronation Street is on fire next week – in more ways than one. The tram crash screening was followed by a Q&A session and then various interviews over lunch with cast members and members of the production team. Below are three of my stories from yesterday, followed by an edited highlights transcript of both the introduction to the screening and subsequent press conference – for those who want to read more. There are some spoilers if you’ve been avoiding coverage of the big week – but, rest assured, there is NO reveal of who dies. 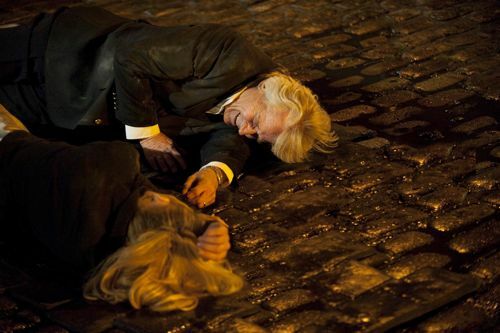 IT’S shock and awe in Devastation Street in the most expensive and dramatic episodes ever filmed on the Corrie cobbles. The £1m tram crash, which leads to three funerals, will include a birth, a death and a marriage in the hour-long live episode next Thursday. Corrie is on fire next week when a gas blast rocks new bar The Joinery, underneath the viaduct arches, as Peter Barlow (Chris Gascoyne) celebrates his stag night. Sparks fly as the horrified driver of a yellow Manchester tram spots the twisted and broken rails ahead. He sounds his klaxon and slams on the emergency brake – but too late to avert disaster. 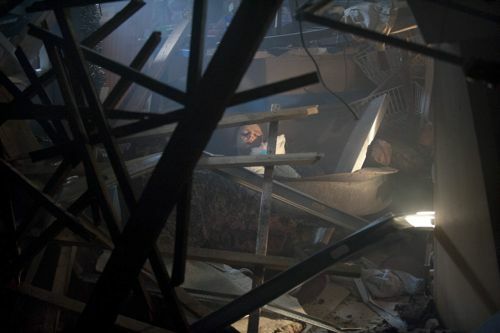 The carnage, screened at the end of Monday’s second episode, sees one screeching carriage hurtle into Dev Alahan’s (Jimmi Harkishin) corner shop. Inside Molly Dobbs (Vicky Binns), holding baby Jack, runs for her life as the tram speeds towards her. 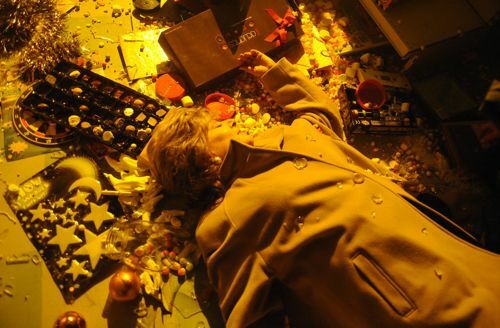 Meanwhile the last tram carriage rears up into the air and swings down on to The Kabin, where Rita Sullivan (Barbara Knox) is reaching for a box of chocolates. Corrie legend Bill Roache, who has played Ken Barlow since the first episode on Dec 9 1960, said it was a fitting tribute for the 50th anniversary. The gas explosion sparks a week of action packed tram-tastic drama – all set on one night – which will change the lives of the Rovers regulars forever. 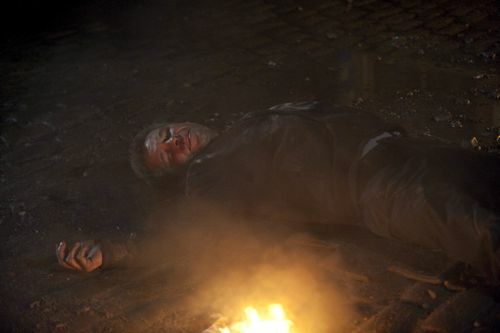 It also includes a fourth death as a killer uses the crash to cover his own tracks. 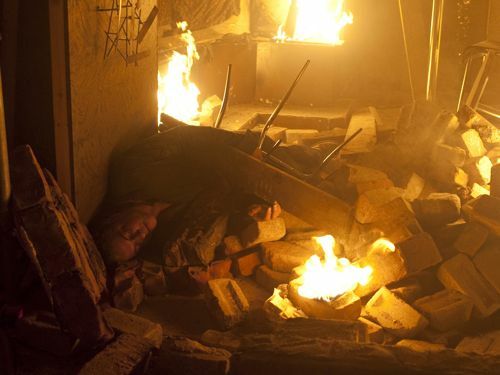 A road traffic accident elsewhere delays the emergency services, leaving stunned Weatherfield residents to rescue those trapped in the wreckage and flames. The cast and crew are now deep into rehearsals for the hour long ITV1 live episode. Jennie McAlpine, who plays six months pregnant Fiz Stape, said scripts were still being changed with just days to go before the big night. “In a way, I hope there is some spanner in the works that we don’t know about,” she said. “They are brilliant episodes .But we’re not doing it again. Someone else can,” he laughed. STUNNED cast members were in tears after watching a special preview of next week’s tram crash episodes. “There was a collective gasp when it came off the rails,” said Antony Cotton, who plays kicker stitcher and barman Sean Tully. Jennie McAlpine (Fiz Stape) was among cast and crew members who gathered for the first screening at the Corrie studios. “It was amazing. There really was a big gasp. We were in shock – we sat there for about 15 minutes afterwards,” she said. Producer Phil Collinson said he was “thrilled” by the reaction of the cast and crew, who gave the episodes a standing ovation. “It was the first time an audience had watched the episodes. And there was literally a gasp as the tram crashed off the viaduct. CORRIE fans are to see beyond Weatherfield for the first time. Monday’s opening episode starts with Ken Barlow (Bill Roache) and Janice Battersby (Vicky Entwistle) passing each other on the cobbles and sharing an exchange about Peter and Leanne’s forthcoming wedding. The opening titles then begin, with the camera sweeping up to show a new computer generated view of streets beyond the tram viaduct. And later in the week, eagle-eyed viewers will see a new glimpse of the world at the other end of the Street. “They’ll be able to spot the Red Rec, The Precinct and all sorts of landmarks, if they pause their TV. 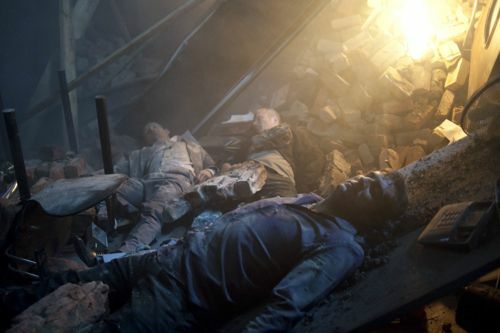 It’s a great shot,” said producer Phil Collinson. Large outside broadcast trucks are now in place behind the Rovers Return, ready for the hour-long live episode. “And so I went to his office and we had a little party. We had mince pies and we had sausage rolls. I gave him champagne and he gave me Diet Coke. He took the champagne home anyway because he didn’t want to miss or fuzz up anything. He wanted to watch it. “It was one of the happiest days of my life, seeing these episodes because I have this theory about Phil Collinson, that he’s half my age, but I think when he was born, some wicked fairy injected a little drop of my blood into his veins. And it really shows in these episodes. “And something else shows that I liked, very, very, very much – you can see thousands of hundred pound notes going up in flames,” he laughed. “These are brilliant episodes and I’m so proud of them. I’m a new boy here, really. 50 years of a show but I’ve only been here for eight months. It’s been a hell of an eight months. Exciting, adrenaline-fuelled and all of it funneling towards next week. “I just kept waiting for people to say no. Every meeting I’d go to, I’d say, ‘Well, we’ll have this and then this can happen and this could happen.’ And they never did. And most of all, ITV didn’t, when we asked them for quite a sizeable chunk of money to make this week as special as we thought it ought to be. They said yes, and they gave it to us – which is an absolute first for me in television, I have to say. “So thank you very much, really, to Peter Fincham (ITV Director of Television) and to Laura Mackie (ITV Head of Drama) for everything they’ve done to make these episodes possible and as spectacular as they should be. They’ve really showed how much ITV loves Coronation Street and how much they appreciate everything it does for them. And also Steve November (formerly known as Steve Frost, ITV Continuing Drama Producer) who works editorially between ITV and us, who is just the best person for that job, because he’s produced the show himself and he knows and understands it so well and gives it all the support that he possibly can. “We’ve got an amazing team working here. My right and left hand Louise Sutton (Series Editor) and Clare Winnick (Head of Production), who just supported me every single day along this journey and they’re amazing and brilliant. And like everybody over there…not just work colleagues but brilliant friends. “A lot of love goes into making this show, as I’ve discovered. More love than I’d ever seen go into any show that I’ve ever worked on anywhere. So thanks to them, and to the amazing team, the amazing crew and the amazing cast, who have pulled out all the stops across the last couple of months to do something really difficult. Because these episodes are as big as anything I’ve ever produced. As big as anything I’ve actually ever seen. And I think they really are spectacular. “They really are big and special. And quite right too because 50 years is an astonishing achievement. “The tram crash happens at the end of those first few episodes and the rest of the week plays out exactly as we intended it to. Because it’s not about emergency services and, yes, it’s about digging people out of rubble. But it’s actually about a tiny street in the north of England battling against the adversities of life. It’s about love and it’s about life and it’s about death. It’s about everything that it was about 50 years ago when Tony came up with it. When will viewers learn the identities of those who die? What would cast members no longer with us think of it? The cast and crew screening earlier in the week? Feelings ahead of the live episode? Is there a worry that it might snow? Phil: “I think that, actually, is part of the experience of live. And it’s why we wanted to do it and it’s why we wanted to do the live…that first episode could have been the live one, actually. It’s a brilliant episode and it’s beautiful and dramatic and amazing performances. We didn’t want to do that. We wanted to put the live episode right in the middle, with fire and explosions and flames and stunts and death…fire engines…just everything we can throw at it. It’s amazing, huge and, hopefully, fingers crossed, astonishing. Did they research real life accidents for this storyline? Will six months pregnant Fiz be in labour during the live episode? We see beyond the tram viaduct in the opening to Monday’s episode after a short scene before the opening titles? Is this the first time we’ve seen beyond the tram viaduct? Use of the baby who plays Jack in stunts? Does this week of episodes set a benchmark for the future of soap? Phil: “I hope so, that would be nice. I think the viewers will have to tell us, really. I’m very proud of them. 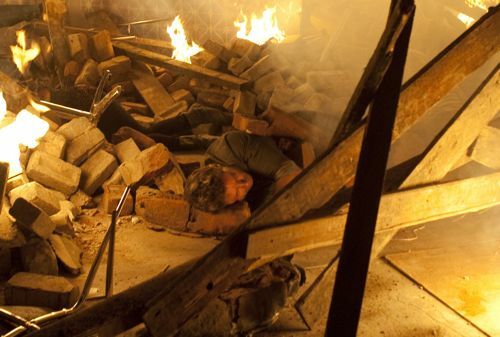 Coronation Street has always done big stunts. They collapsed number five or seven right back in 1965. And then in ’67 a train came off the viaduct. A lorry ran into the front of the Rovers. The Rovers has burnt down. There’s a million and one stunts. It’s always had that in its DNA, it’s always had times where it’s been event television. When the Rovers burnt down, they were the first show to do that and to say, ‘Look we can do this, we can take one of our main landmarks, burn it to the ground and isn’t that brilliant television?’ It’s always been copied. So in terms of being a benchmark, I think it is a fantastic week of television. I hope you agree that sequence is brilliantly realised. I’ve worked on a lot of special effects television with Doctor Who and you’re trying to turn Cardiff into Mars, or whatever. It doesn’t actually take that much imagination. But I think to take our ‘lot’ here and make something that feels real and visceral and terrifying, like that does, I think that’s a really, really difficult thing to do, and all the devastation that comes afterwards. “It isn’t just one event and one set, either. That whole sequence there, if you put it on pause, I think it’s something like 14 different stunts, it’s a whole sequence of different sets that we had to build. It took us the best part of a day just to film that tram coming through the shop. It’s real – and it had to be real. It had to be visceral. The viewers at home have to feel that fear and that tram chasing Molly through that shop. We were really clear that that was what had to happen. And in order to achieve that, we had to build the front of a tram – well, Danny did – the front section of a tram. It was built on a great big train line in one of our studios. So we had to clear a whole load of sets out of the way in order to do it. We had to build the whole corner shop around the train line and then build a whole section of the corner shop out of soft material that would just shatter and not hurt somebody. And then we had to put a stunt performer in. And then we had to really fire that tram, really fire it through that set, and the poor stuntwoman had to be really chased by that tram. So it’s an incredibly complicated, different sequence of events that come together to make what is actually, all in all, two and a half minutes of television. “I hope that’s a benchmark. But we’re not doing it again. Someone else can do it,” he laughed. Phil confirmed that the cost of the tram crash episodes was “not too far off” the £1m already reported in some newspaper. Do soaps of today have to go in for huge spectacles like this to draw in viewers? Phil: “I think that television has changed. I think programmes like Coronation Street, dramas, have to stand up against massive pieces of event television like Strictly, like X Factor now, and massive pieces of event like ‘Celebrity Jungle’, that you just come to because it’s special and it’s different and it’s unusual. So we had to do something like that to mark this show, really. We had to do something extraordinary. The cast and crew screening? Still getting amended scripts for the live episode? “There was a gasp. It was really thrilling for me to see it because it was the first time an audience had watched the episodes. And there was literally a gasp as the tram crashed off the viaduct. And everybody rose to their feet at the end and applauded themselves. “I started by just saying, ‘Look, sit back and watch this and give yourselves a massive pat on the back because you did this.’ And so it was great for all of us. It was a really good night just for the team, really. Posted in Coronation Street and tagged Antony Cotton, Coronation Street, Jennie McAlpine, Michael le Vell, Phil Collinson, Tony Warren, Tram, William Roache. Bookmark the permalink. Wow a throughly thought out post, very well written. I have watched all the episodes from 1969 to the present, I can relate to the past episodes mentioned. Phil is quite right when he states that Corrie is about one street in Northern England, which makes Corrie unique. Carry on the good work. I cried! I agree, I did shed tears as well. Watching this was very emotional! It’s like losing your best friend and realizing why Corrie is remarkable. This story line will remain memorable for every ‘die hard’ Corrie fan everywhere in the world (I’m in Canada) and will bring Corontation Street and its fans into the next 50 years of loyal viewing.